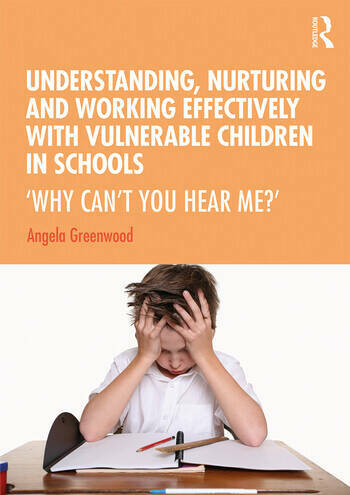 Understanding, Nurturing and Working Effectively with Vulnerable Children in Schools: "Why Can't You Hear Me?" In times of increasing pressure on schools and teachers, it is essential that teachers are equipped to understand the emotional and relational factors in learning and teaching. Vulnerable and disaffected children need understanding and nurture rather than reactive management, which can easily exacerbate their difficulties, leaving them unheard and defensive, and even undermine teacher confidence and effectiveness. Written from extensive professional experience, this is an essential handbook and resource book for trainers, schools, teachers and school staff,　and for educational psychologists and those in children’s services working with vulnerable children in pre and primary schools, as well as those in special schools and units. Angela Greenwood is an educational psychotherapist with many years experience training and supervising staff, and working therapeutically with children in domestic abuse, pupil referral unit and mainstream settings, and in private practice. She co-facilitated the local Nurture Network, and the ‘Safe to Learn Course’ for school staff.